Even before the Christian era, the Friesian horse was already a highly favoured horse for use in battle. As early as around 150 AD Roman historians made mention of Friesian cavalry in Brittania near Hadrian’s Wall on the border between Scotland and England. The well-known English writer, Anthony Dent, describes the presence of independent Frisian troops near Carlisle in the 4th century AD. They cared for their own horses and were not registered as regular troops. It is highly probable that both of these cases referred to Frisian mercenaries mounted on Friesian stallions. The same Anthony Dent, and other writers as well, mentioned that Friesian horses provided the foundation for “the Old English Black”, the ancestor of the familiar English Shire and also of the Fell Pony, which still bears a remarkable resemblance to the Friesian horse. William the Conqueror used horses showing a remarkable resemblance to Friesian stallions at the Battle of Hastings on October 14, 1066. The countless illustrations of knights and nobles on the tournament fields showed horses that even then were known as Friesian horses. It is also highly plausible that the Friesian horse, just like other representatives of the Western European horse, was influenced by Arab and Andalusian stallions during the crusades and then later during the 80-year war with Spain. The breed’s more or less concave nasal bone, its gracefully arched neck, and its trot provide a certain amount of support to this hypothesis. The first written proof of the use of the name “Friesian horse” can be found in a report saying that the German Elector Johan Frederik van Saksen rode a Friesian horse in 1544 to the Reichstag in Spiers. Three years later at the Battle of Muhlberg this stallion was ridden by Johan Frederik and apparently attracted a lot of attention as Emperor Charles V recognized him from far away by his horse. Also very famous is the etching dating from 1568 of Phryso, the stallion owned by Don Juan of Austria in Naples. In the 17th century, Friesian horses could be found along with Spanish breeds in the various riding schools where the haut rcole of riding was practiced. It was at this time as well that in addition to being a favoured breed for the haut ecole the Friesian horse was also frequently used as a carriage horse (carossier). During the course of the 18th and 19th centuries, the use of the Friesian horse began to become more and more limited to the part of The Netherlands we now know as the Province of Friesland. Undoubtedly, this can also be attributed to the decline of the nobility on the European continent after the French Revolution. In rural Friesland at the end of the 19th century, the Friesian horse had predominantly become the horse for the wealthier, landowning farmers who, as an expression and confirmation of their prosperity, used a pair of Friesian horses to pull their gigs to church on Sundays. The horse was also used for pleasure in the form of short-distance trotting races in which the horse was ridden with a small orange blanket on its back instead of a saddle. 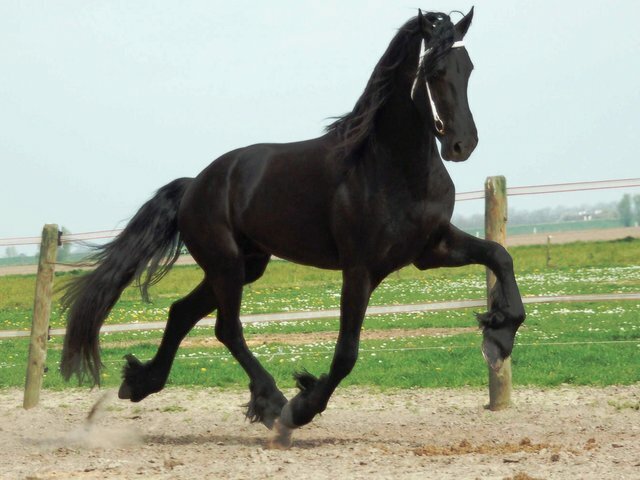 It was also at that time that the Friesian breed produced some renowned trotters and it is almost certain that the Friesian horse was also used then in the breeding of the Russian Orlov trotter as well as in the strongly-emerging breeding of American trotters. At the end of the 19th century and the beginning of the 20th century the Friesian horse experienced a very difficult period having to vie with heavy breeds of the Gronings-Oldenburger type known as Bovenlanders. This competition was almost fatal. Besides occasional use for pleasure in the form of pulling the gig, and tilting-the-ring competitions on Sunday (while the driver drives the horse, his companion tries to aim a slender wand to pick up a little ring), a great deal of heavy farm work had to be done, and this horse with the blood of a ‘noble country gentleman with a talent for dancing” wasn’t entirely suited for this role. The result was that many farmers ended up switching to the Bovenlanders that were especially bred for this heavy work or crossed their Friesians with heavier breeds. This was almost the end of the Friesian breed. This was why on May 1, 1879, a group of people who were very concerned about the future of this ancient breed met at De Drie Romers–a tavern in the Friesian town of Roordahuizum–and founded the Friesch Paarden-Stamboek, FPS. This became the founding of the first studbook in The Netherlands. It soon became evident that the registration of the remaining Friesian horses in genealogical registers was having a stimulating effect on the breeding of the Friesian horse. Even so the increasing popularity of the Bovenlanders was still very hard on the Friesian horse and its numbers declined sharply during the early years of the 20th century. By 1913, there were only 3 older studbook stallions available for breeding with no prospects for adding young stallions to their numbers. It looked as if the breed was doomed to extinction. It was at this time that around a hundred Frisians got together in the Oranje Hotel in Leeuwarden and founded an association for the Friesian horse in addition to the studbook in order to stave off what looked to be the breed’s seemingly unavoidable demise. Their objective–to apply a well-considered and expert acquisition and rearing policy for the remaining full-blooded colts that displayed sufficient quality– breathed new life into the breeding efforts. And so it was that the Friesian horse was spared what looked like certain doom. In addition to the Friesian horse’s fantastic conformation, it also has a wonderful character evident in its friendliness, intelligence, adaptability, and its enormous willingness to work. It’s this character in particular that has contributed to the fact that through the centuries there have always been people willing to do anything to preserve the breed. Those supporting the Bovenlanders were often disproportionately hard in their judgments about the Friesian horse. One of these was that the Friesian “danced too much in front of the plow and thus wasted useful energy.” Although the statement contained a spark of truth, these people didn’t know the history of the Friesian horse and that deep, deep affection between a person and a horse, the kind that is so often seen among people and this breed in particular. After this low point in 1913, there was no other choice: the Friesian horse would simply have to compete with the Bovenlander. Some of its luxuriant looks would have to be compromised for more horsepower, and this led to a somewhat smaller and heavier type of Friesian horse. The result was a type that we no longer appreciate since what we want now is a return to luxuriant manes and tails, and ‘long lines’. Back then, however, other rules prevailed. These changes were a bitter necessity in keeping with the demands of the times. Fortunately, characteristics such as noblesse and luxuriance were anchored deeply enough in the genetics of this ancient breed and these would again start playing a crucial role in a more recent and much happier phase in its history. But that time hadn’t yet arrived. Before it did the Friesian horse would have to pass yet another test. The 1960s was an era of crisis in the breeding of horses. This time, however, the reasons were much more irreversible and inescapable than those causing the crisis of 1913. Back then the problem had centred around a competition between breeds of horses at a regional level. The present problem was the worldwide phenomenon of discontinuing the use of horses as a source of power in agriculture! With the unexpectedly rapid pace with which farms became mechanized, all horses kept on farms soon became redundant. Most farmers lacked the time and money it took to keep horses simply for pleasure. Progress was inevitable, but it was also accompanied by much sadness. It often wasn’t until years had passed before the level-headed Frisian could, not without emotion, relate the story of how the horses disappeared one day. Once again, the ancient native breed was being threatened with downfall. In 1965, the studbook contained only about 500 registered mares. But once again, Frisians sounded the alarm in defence of a horse facing extinction. With might and man they attempted to turn the approaching tide. It is quite possible that all these efforts, as heart-warming as they were, would have come to nothing had it not been for a powerful factor that came to the rescue of the Friesian horse at the very last minute: the economy took a very good turn for the better after the damage done by World War II. The increased opportunities made it possible to devote time and money to relaxation and the Friesian horse had a new lease on life. It would become a horse enjoyed simply for the pleasure it could give. In just two decades, the Friesian horse took a spectacular lead over many other breeds; its exceptionally friendly disposition, intelligence and honest character being factors in its successful comeback. Its wonderful character made it perfect for recreational use by people who hadn’t been raised with horses. In just a short space of time the potential of the Friesian horse for pleasure riding and equine competition – now that people had more time for these activities – was rediscovered. In a relatively short period of time, people once again discovered what kinds of fantastic qualities the Friesian horse possesses for providing people living in the computer age with a sense of relaxation and adventure outdoors. Possibilities which can only really be understood when we know about the history of the Friesian horse, possibilities that have lain anchored for centuries in its genetic potential. As it turns out, the Friesian horse is the ideal partner for all kinds of driving purposes. And its potential for dressage was also soon rediscovered. When all this was happening, the Friesian horse was on a real comeback trail. Famous four-in-hand drivers such as Leo Kraayenbrink and Tjeerd Veldstra took their Friesians into international competition in combined driving events and Friesians were increasingly seen in the higher levels of dressage. Perhaps even more importantly, the Friesian horse’s potential as a show horse was discovered anew: impressive in the show driving classes but also as a circus performer! Since the time just after World War II when the Straszburger Circus began using Friesians, there’s almost no circus left today without Friesian stallions featuring on the program. Finally, the Friesian horses are dancing again!